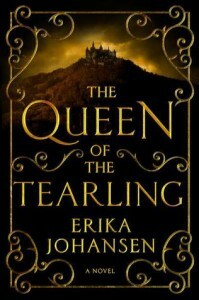 The Queen of the Tearling - There Are Inkspots On My Page! I’m not big on spoilers, but I do think two things need to be clarified before going any further. The first is the intended audience. This book is marketed as YA, and it is YA, but it is definitely one aimed at the older end of the scale - some of the things that come up are not early-teen friendly in my rarely-humble opinion. The second thing is something that confused me for a long time before I realised what was going on. Everything about this book screams historical/medieval fantasy. It’s not. It’s actually set several hundred years after the Earth goes well and truly to hell, so you will find lots of mildly jarring references to modern culture. Strap yourself in and just roll with it, all will eventually be explained. Now that’s out of the way: I really enjoyed this book. Head scratching aside, it has a really interesting and well-written plot, the characters are pretty alright and it left me curious about what happens next. I have a bit of a love/hate relationship with Kelsea. She can be stubborn and a touch arrogant, and when she wants something to happen, she makes it happen and damn the consequences. You’ll either love or hate her for this. Sometimes when she went charging in, I wanted to sit her down and tell her not to be so stupid. But, I feel like that about most 19 year olds, so hooray for realistic characters! Another check on the realistic front is Kelsea’s perception of herself. She’s not tall, thin and attractive. She knows this. She occasionally wishes she were. She gets on and does what she needs to. I don’t know a single teenage girl that doesn’t wish she looked differently, and quite frankly I like how this was approached with Kelsea. She is a normal, healthy teenage girl and it’s so great to see that in any novel. The plot was occasionally shaky, but overall it’s very well done. It does suffer a bit from being book 1 - there are several things alluded to (mostly relating to the world building) that won’t come close to being explained until book 2, but if you have a litle patience (and make it that far), all will be explained. I definitely don’t think that it’s the next Hunger Games or Game of Thrones, but it will no doubt cement itself as Must Read YA for a lot of people. Overall, the good bits are done really well, and the bad bits are very cringe-worthy, but definitely worth a read if YA more-fantasy-than-dystopian is your thing.